We're going on close to a month of this adventure. Almost one full month of no backyard and our house being cased in a fine layer of dirt/dust from the backyard. Seriously though - I could have filled my garden bed with the amount of dirt I've swept/mopped up in the last four weeks. We're nearing the home stretch....well not really...I can see the finish line but we're still miles from it. Kind of like we're stuck in the middle of a desert and there is an oasis glimmering on the horizon. It's there BUT SO FAR AWAY! The backyard has become the bottomless pit of time and exhaustion (mostly on Vern's end). The poor guy hasn't really gotten a break since we started this. On one level it's his own fault. He's the one who keeps adding things like electricity and irrigation. But... on the other hand, I can hear him in my head saying "If you're going to do something do it right." And to think...I thought we were just going to build a box. HA! Last week he finished installing the outdoor conduit for electrical and the sprinkler system for the main portion of grass. I thought we were becoming a tad over the top with all of these new additions, but Vern rationalized them by reminding me that we would never have to remember to water the lawn with a sprinkler system in place. He had a good point. Summer in Wenatchee can get ridiculously hot and the man-friend has a thing about green lawns that might be parallel to the way I feel about peanut butter. Seriously though, once our grass is in and lush, I'm sure I'll find him out there petting it softly and whispering sweet nothings romantically. The kid likes his grass. Once all the PVC pipe was connected and everything was working without leaks, focus turned to the raised platform. This will be the area we place our outdoor table and potentially the fire pit. The boyfriend brought up the good point that we wouldn't want sprinklers spraying all over the table and chairs so he began installing drip lines. Vern cut the ends of the boards with his chainsaw (although it wasn't really necessary - I could have done it with the Reciprocating Saw - pretty sure he just wanted to cut something with the chainsaw). Then I went along and cut the nails holding everything together with the reciprocating saw. Disassembling 12 pallets took about an hour. 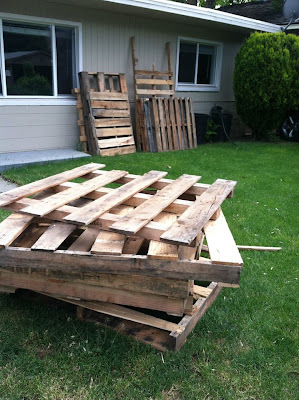 Leaving us with a pretty decent pile of pallet boards to use for the privacy wall. Sadly though, the rain become legitimate and we had to end work for the day, which might have been a blessing in disguise as the boyfriend needed a break. We did manage to get half the plywood up though, inching us closer to the finished product. The pictures don't do the privacy wall justice. Vern is 6'2 and the wall is taller than he is. Living in the city means tight spaces and we don't really want the neighbors being able to peek in all the time. I'm definitely going to need more pallets though.